For most people, crossword puzzles are simply a fun hobby that pairs perfectly with a cup of coffee and a lazy Sunday morning. But there might be something more to these newspaper staples: A growing body of evidence suggests crossword puzzles may actually benefit your brain. Exercising your muscles can make you stronger, but can giving your brain a workout have a similar effect on the mind? That’s the focus of research into the effects of crossword puzzles, Sudoku, and other “brain-training” games. Brain training is the idea that regularly putting your brain to work through puzzles and specially designed online games can help improve memory and other types of cognitive function. One 2011 study of 488 elderly men and women found that those who regularly did crossword puzzles experienced a slower decline in memory after they had been diagnosed with dementia. Of the 101 people who were diagnosed with dementia during the course of the study, those who did crossword puzzles delayed their loss of memory by more than two and a half years. 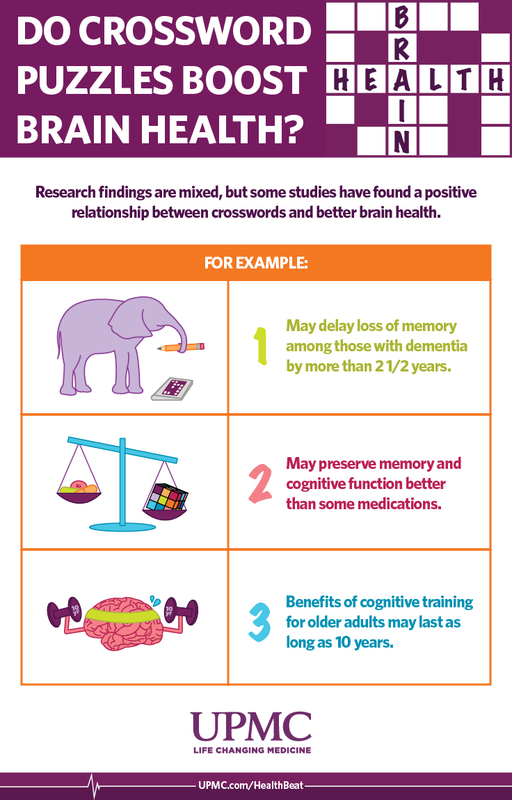 A 2013 review of previously published studies found that forms of mental exercise, such as crossword puzzles, were among the most effective ways to preserve memory and cognitive function — in fact, there was better evidence for these approaches than for some medications. A 2014 trial funded by the National Institutes of Health found that the benefits of cognitive training for older adults can last as long as 10 years. The researchers recommended that older adults try any cognitively stimulating activity, such as solving crossword puzzles and playing cards. Findings like these are good news for American adults who do crossword puzzles. If numbers are more your thing, consider Sudoku: Some experts believe that this type of puzzle may be even more effective than crosswords at exercising the brain.